Capsugel utilizes a full range of technologies with which to modulate pharmacokinetics of drug compounds, often in conjunction with other enabling technologies, e.g. solubility enhancement, to optimize drug performance and therapeutic effect. We tailor the formulation approach taken to the specific characteristics of the drug or drug product intermediate and the target product profile. Many of the technologies utilized are proprietary and have been developed to meet very specific drug delivery challenges. Special processing techniques and customized equipment ensure optimized product development and manufacturing at clinical and commercial scale. A full range of release profiles can be achieved with Capsugel technologies. Immediate release, enteric protection, delayed release, controlled or extended release, dual release, fixed dose combinations, and site-specific release are all routinely utilized in product design and development. Pediatric applications often utilize one of several multiparticulate processing approaches, often combined with taste-masking technologies, and specialized sprinkle capsules for ease of dispensing. Abuse deterrent approaches can also be built into the formulation design where applicable, e.g. opioids. Capsugel’s oral multiparticulate (MP) technologies enable our product development teams to address a broad range of development challenges. Common applications include modified release dosage forms, fixed dose combinations, and effective formulation approaches for specialized patient populations, such as pediatrics. Capsugel has successfully used a variety of formulation strategies, including multiparticulate and capsule-coating technologies, to achieve colonic drug delivery. Combining its expertise in polymer science and capsule engineering, Capsugel has developed a line of capsules that achieve enteric protection and delayed release with the need for an enteric coating. At Capsugel, we believe that robust product design is key to successfully advancing compounds, and results in overall speed-to-market. Our novel approach to drug delivery science enable us to produce multiparticulates with extrusion/spheronization technology from lab scale through clinical trial material and small-scale commercial quantities. Capsugel offers several approaches to achieve combination-drug or dual-release functionality in a single dosage unit. The choice of approach is based on the active ingredients, target product profiles, and commercial objectives for the combination drug product. Capsugel has extensive experience in designing, formulating and scaling mulitparticulate dosage forms at feasibility, pilot and commercial scales. Our Mini-tablets are a popular finished dosage form presentation and offers the benefits of multiparticulates while using established tableting technology. Extended release (ER) is often needed or desired to deliver crystalline and solubilized forms of compounds in once- or twice-daily dosing regimens to maximize therapeutic effect. 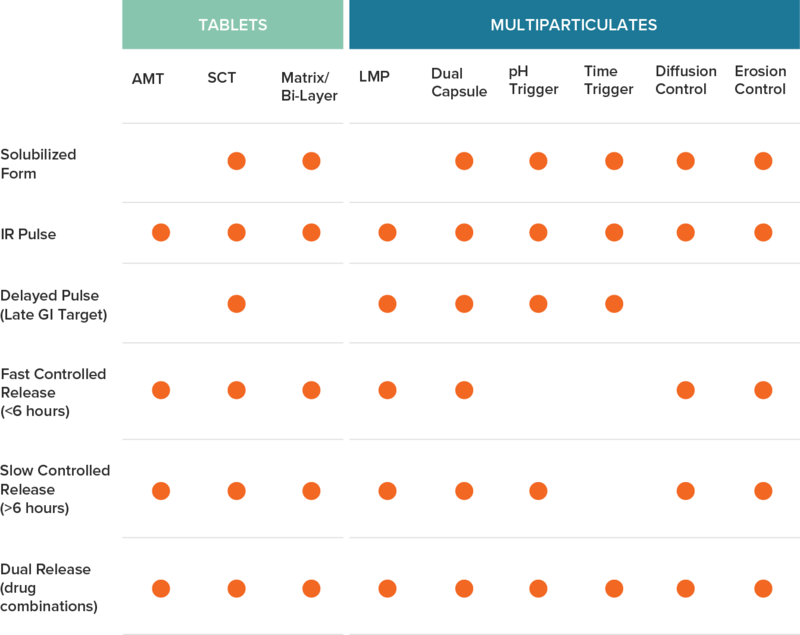 At Capsugel, we utilize two osmotic tablet technologies: proprietary asymmetric membrane technology (AMT) and swellable core technology (SCT) to help ensure consistent drug release over time. Capsugel is well versed in using drug layering and modified-release coat layering to achieve a range of dissolution profiles in multiparticulate format. Common applications include delayed release, extended release, pulsatile release, and fixed dose combinations. Capsugel’s multidisciplinary teams work closely with clients to clearly identify and understand their problem statements. Using our collective expertise in formulation science, we focus on key physical and chemical properties of the compound and dosage-form requirements, working collaboratively with clients to develop tailored problem statements specific to each compound. Technology selection methodologies, based on predictive modeling, are utilized in selecting optimal formulation approaches to achieve target product profiles and rapidly advance drug concepts. Have a Targeted Delivery challenge?